Ripley Castle is located in the estate village of Ripley, just outside of Harrogate in the direction of Ripon. Home to the Ingilby family for over 700 years, the house and gardens are open to the public all year round and the pretty village is also a popular place for visitors to stop off for an ice-cream at the renowned ice-cream shop. 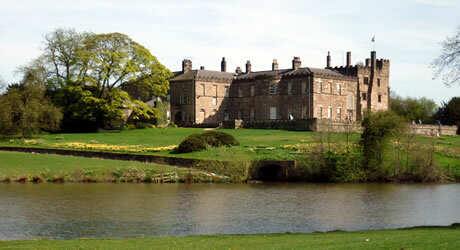 We visited Ripley Castle on a sunny day in the Spring and chose to visit only the gardens. It makes for a delightful and fairly short walk to head down to the waterfall and lake and follow the lakeside path to the far end and back round to the walled gardens and house. Although there were plenty of visitors in the village you can escape the crowds in the gardens where deer and cattle graze. We didn't visit the interior of the castle/house on this occasion but tours are available daily which are supposedly designed to be interesting for both adults and children with some tours offered which are specifically aimed at children. A good way to finish off the walk or visit is to enjoy a drink in the castle's tea room. Entry to Ripley Castle is £8.50 for castle and gardens or £6 for gardens only for adults, with a reduced price for children aged 5-16, and children under 5 are free. Family tickets are also available. This entry was posted on Wednesday May 18th, 2011 at 3:43 PM and is filed under Places to Visit, Things to do, Places to Walk.You can follow any responses to this entry through the RSS 2.0 feed. You can leave a response.